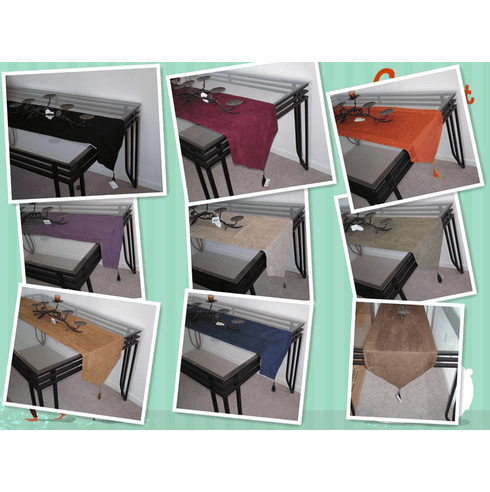 Brand New Heavy Duty Micro suede table runner scarf. Micro suede is a colorful, versatile, durable luxurious micro-fiber fabric. It is becoming one of the most popular fabrics used in upholstery, bedding and clothing. Our Bond Micro Suede collection is recognized for its ultra soft feel, smooth texture. Also, it is resilient, does not absorb liquids easily, less wrinkle and easy to maintain. Color khaki, Taupe, Black, Chocalate Brown, Royal Blue, Rust, Wine, Olive Green, Sage Green and purple are available. Size: 15x72", good for 4-6 seats chairs table and medium size conference room table.